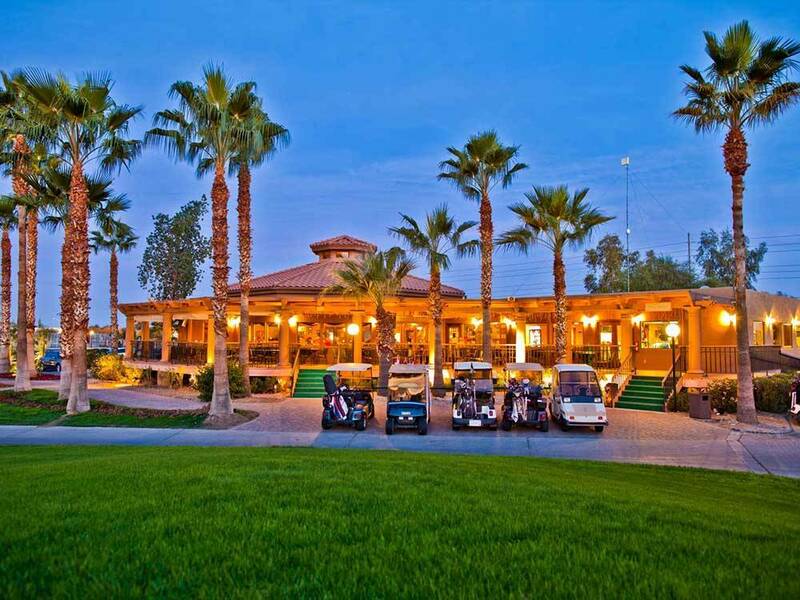 Our Country Club & RV Resort is a 55+ gated community just mins. from Phoenix. Full of Big Rig Sites/Park Models to Rent or Purchase a Home. 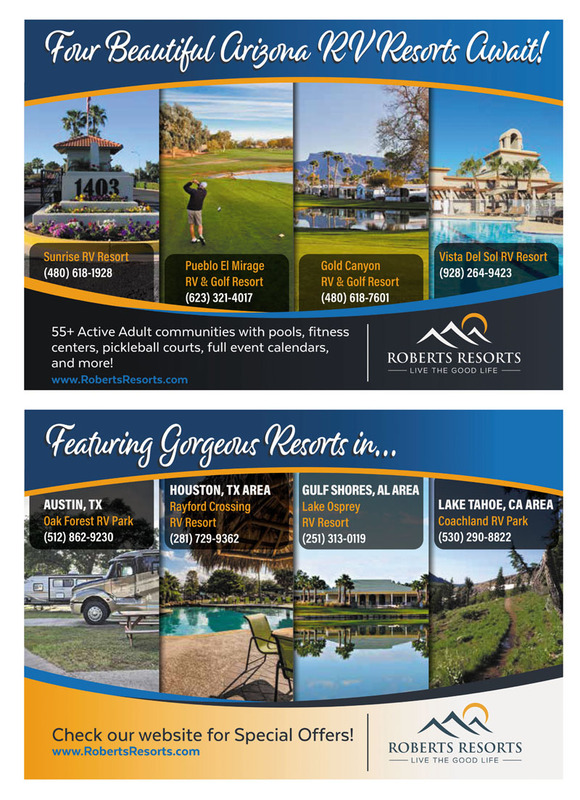 Enjoy our 18 Hole Golf Course/Pro Shop/Restaurant/Lounge/Pool/Spa & more. 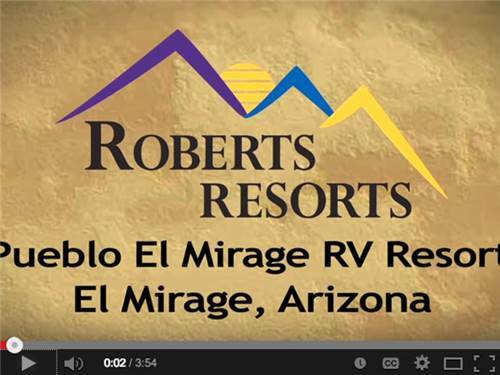 This is perhaps the cleanest and best maintained RV facility I have seen. Its a huge park with a few hundred RV sites and many other sites that have modular homes on them. Its is above all else a GOLF RESORT and is a gated community with fulltime security. Jets from the nearby air base do fly about 5 days a week and can be a bit noisy at times. I have a month here at a premium site where electricity, cable and wifi are all included and so far all those services work as expected with little issues. The staff and service people are all exceptional in offering assistance and information. The amount of activites offered is amazing from water aerobics to painting to glass work. They have an awesome billard room. The location on the west side of Phoenix is pretty nice, just 10 minutes off the 101 and I10. All needed local facilities such as food, gas, etc as well as dozens of restaurants all with in 15 minute drive time of the park. In park services for garbage curbside pickup twice a week is free, local propane service comes into the park 3 days a week and is easily scheduled to stop by your RV to fill. Wash.Wax services can be purchased as well as any needed maintenance work. This is a high class park and you can see it in all the rigs that are here. I figure for $1000/month for what we are getting is unbeatable and we don't even play golf. I stayed here for two months. The park is clean and beautiful. That is the only good thing that I enjoyed. This is the noisiest park I have ever been at. The jets from Luke air force base fly directly over the resort head 5 days a week. you cant even hear to speak.I was over charged for my electricity. If that is not bad enough , most of the people are in there 70 ies , and then I was forced out on the 31st of the month ,when I was supposed to leave on the first.. They hit the golf ball and they land any place. get ready for possible damage to you vehicles. My truck was almost hit on several occasions. I was there two months and my electric bill was over 240.00 without using any air conditioning! Then you have to post a 250.00 refundable deposit to get it turned on! the resort offers electricity too get it started! Beware I saw 4 other people that were forced to leave on the 31st and were overcharged! Unless you are close to 80 I would stay far away from this place!!!!!! Ok, there are some things that have changed here and not all of them good. I used to like coming to this park but they nickle and dime you to death. Be prepared to pay for your ENTIRE reservation upfront with a check ONLY! No credit/debit cards allowed. MAKE SURE YOU AGREE WITH THEIR CANCELLATION POLICY. $30 monthly for WIFI, Electricity is not provided and you must go through the local provider that charges a $25 connection fee. 9 cents per kwh at the time of this posting. (not bad) Cable is $30 - two trash bag limit on twice weekly garbage pick - up and there are no dumpsters on the grounds. I realize that the word 'expensive" is a relative term. This park is expensive compared to what is offered. This park is nice and is well kept. The pools and hot tub area is nice. The mini gym is adequate. If you come in for a week or two - this park is perfect. Longer stays? Well, not so much - very cliquish and not prone to mix and mingle activities. Do yourself a favor. If you are going to stay in the area for longer than a week or two, look at other parks that are the same price but offer oh so much more. I wish we would have looked before we leaped.